The UN has condemned the refusal of South-East Asian countries to rescue thousands of migrants adrift at sea. At least 700 Bangladeshis and Rohingya from Myanmar were rescued off Aceh last week by locals, bringing the numbers in camps there to at least 1,500. UNHCR spokeswoman Vivian Tan said the lack of rescues over the weekend was a "bad sign". Aid agencies say a grave humanitarian crisis is in train as countries in the region refuse to accept the migrants. People on the boats are believed to be severely malnourished. Survivors who have made it to shore say there have been deadly fights on board over food. Ms Tan warned that "time is running out" to help the migrants. "We were hoping that more ships would be found, and that more people would be rescued and allowed to come onto shore. Unfortunately, this didn't seem to have happened," she said. The Indonesian authorities have told fishermen not to help the migrants - unless their boats are sinking or they are in the water. Military spokesperson Fuad Basya said fishermen could deliver food, fuel and water to the boats, or help with repairs, but that bringing them to shore would constitute an illegal entry into Indonesia. Some fishermen in Indonesia's Aceh province had told the BBC that they were not allowed to help migrants even if they were drowning. Thousands of people - mostly Rohingya Muslims fleeing persecution and poverty in Myanmar, but also Bangladeshis looking for work - are thought to be stranded out at sea. It is hard to imagine any governments taking a more hard-hearted stance than those in South-East Asia towards the migrant boats off their coasts. Malaysia has blockaded its north-western sea border to stop them entering. Thailand has hurriedly repaired boats' engines and shooed them over its border, despite near starvation and illness on board. 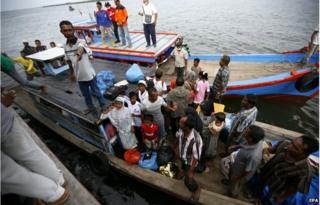 Now fishermen in Indonesia say they have been ordered not to pick up anyone at sea. Why? They certainly fear a deluge of migrants if they open the floodgates. They blame Myanmar for causing this crisis through its terrible treatment of Rohingyas. Myanmar refuses to accept responsibility. But arguing over who is responsible for these migrants should not be the issue right now. Saving lives should be. Meanwhile the mayor of Langsa, the Indonesian port where many of the migrants are being cared for, has said the city has no budget for aid on this scale, and that it has received no help from Jakarta. "In short, yes, we need some help, immediately, from our national government or any other institution, including NGOs, to take care of the Rohingyas who are stranded in our place," said Usman Abdullah. Why has this crisis erupted? Rohingya Muslims mainly live in Myanmar - largely in Rakhine state - where they are not considered citizens and have faced decades of persecution. Rights groups say migrants feel they have "no choice" but to leave, paying people smugglers to help them. The UN estimates more than 120,000 Rohingyas have fled in the past three years. Traffickers usually take the migrants by sea to Thailand then overland to Malaysia, often holding them hostage until their relatives pay ransoms. But Thailand recently began cracking down on the migrant routes, meaning traffickers are using sea routes instead, often abandoning their passengers en route. Why are so many Rohingya stranded at sea?